Pictured finishing his Championship at 1 year of age. In 2000 Eli has started to come into his own. The reception and comments he has recieved from his competition and other breeders has been heart warming and in the short journey to his Championship he has gathered many fans and supporters.. He earned 6 points from the Senior Puppy class and finished his Canadian Championship with WD & BW his first two days as an Open Dog (one year and one week of age). It was especially nice that he finished on CANADA DAY!! This is the 7th Champion for his dad and makes Harley a Sire of Merit. 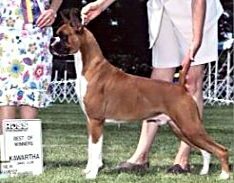 Among Eli's wins was a Best 9 to 12 puppy male in Sweeps at the Boxer Club of Canada Specialty under Scott McNair. Pass your mouse over the italicized names to see thumbnails in the space below.